“Green” is such a “buzz word” these days, and companies are scrambling to find ways to be “green” so they can tell us that they don’t harm the environment. Montessori Academy doesn’t have to scramble, because Mrs. Justus founded the school on principles of caring for ourselves, our school, and our environment. Here are just a few of the ways that our school has been “green” for 60 years. When Mr. and Mrs. Justus bought the property for Montessori Academy at Spring Valley, the term “environmentalist” may not have even been coined. At that time and for decades afterward, the local city allowed builders to pave over the Hylebos in most of its locations. It runs underground more than it does above ground. 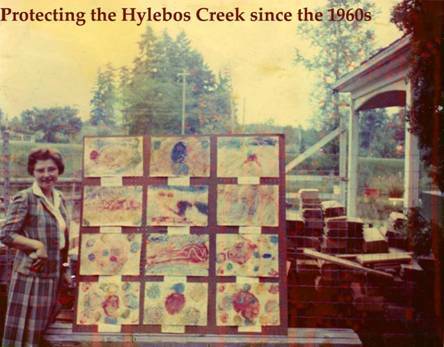 Mr. and Mrs. Justus worked to preserve the Hylebos Creek, its natural plant life, and the animals that live there. Below you will see a picture of Mrs. Justus with a board of pictures that children drew depicting the life and plants in the creek. In the late 1980s, before anyone was monitoring our local declining Salmon population, our school started its Salmon Project. That's over 25 years of helping the salmon! Every year the 4th - 8th grade students get salmon eggs from our local hatchery, and then raise them until they are fingerlings. The students study the life cycle of the salmon, and then go to the younger students' classrooms and teach them about the salmon. The young children love having the older students in their classes! All of the classrooms love taking nature hikes to visit the salmon tank and see the progress of their growth. It's really fun to be part of helping the environment, and helping the dwindling Salmon population. You're never to young to think about how you can make a positive impact on our environment and the world. Starting in the 1950s, Mr. & Mrs. Justus and the school saved vegetable scraps and composted them for later use in gardening. Waste not, want not! Before Federal Way had curbside recycling pickup, there were a few recycling stations in the Greater Seattle Area. The school collected newspapers, regular paper, soda or pop cans, and glass and hauled it all to one of these recycling centers. The most ideal way to help the environment is to find a way to reuse items that would otherwise be garbage. Ever since you could make copies using a ditto machine, the school has reused all of our used copies as note and message paper. We cut it into 4 pieces, and use it instead of Post-It Notes. It’s better for our environment. As children outgrow their school uniforms, we encourage all parents to donate their school uniforms to the Uniform Rack. Then, for $5/item other children can wear them. The plaid jumpers seem to last forever, so many children have been able to get good use out of them. The buildings that Mr. & Mrs. Justus built are made from solid cedar. Cedar doesn’t rot, so the buildings last a very long time, and they are earthquake-safe. Plus, solid cedar requires no insulation. In addition, all buildings built by Mr. & Mrs. Justus maximize natural light. They knew that having more natural light saves electricity, is better for our eyes, and windows allow us to see nature. When you look at the world’s problems, they seem daunting. How can one person make a difference? Mrs. Justus and the school have taught students for years that the key is to think about the world’s problems and to do your best to make changes right here in our own community.